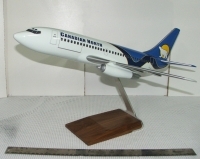 This 1:60th Pacmin B737-200 was purchased directly fromt he Canadian North offices about 8 years ago. Love the scheme. FOR SALE: $1495 USD MODEL LOCATION VANCOUVER, CANADA. Model is in mint condition. Buyer pays actual shipping cost.